All About Me... .. . . . . . . . . I have been painting for more years than I care to remember. I have exhibited extensively in this time, having solo and group exhibitions in major cities in South Africa, USA and the UK. I have collectors all over the world. My colour palette is strong and vibrant; fun and quirky. 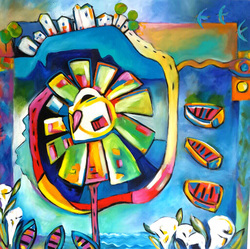 There is an element of whimsy and fantasy to my art- and a freedom with a loose lyrical quality. into my own personal visual creations . Thank you for stopping by to view my art . I have been called a gypsy at times. Each work that I produce is an original landmark and one of the mileposts of a record along the my way as an artist. ​Artist Ronnie Biccard has come home. She has returned to her South African roots after many travels and years of living in England. It's not often that one comes across an artist whose paintings eloquently reconcile the extremities of dynamic, vibrant colour with peace and harmony. Ronnie's work contains fascinating contradictions, many of which appeal emotionally to collectors of her art worldwide. Her work celebrates love, romance, conviviality and sunny Mediterranean landscapes, which she delivers with colourful splashes of wine, women and song. 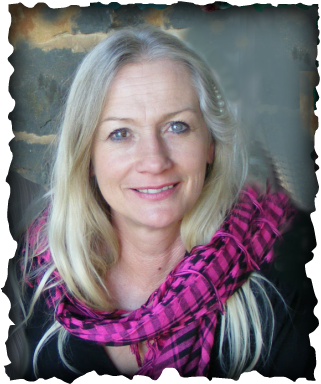 Strong musical themes run through her work, underlining the peace and harmony she so loves. ​​In her Goddess Series, Ronnie celebrates Woman as Warrior, Woman as Nurturer, Woman as Maiden, Woman as Lover and Woman as Crone. She is no 'burn the bra' activist, but as Warrior herself, naturally celebrates the emergence of the empowered modern woman. This is not only a projection of herself, but Ronnie's way of honouring empowered women throughout the world. Equally comfortable using oils or acrylic, her paintings suggest movement, yet, paradoxically, convey an irresistible sense of peace and harmony for which we all yearn. She achieves this with an intuitive, yet confident approach to her subject matter. Her work naturally reflects her chosen home, Cape Town, exemplified by scenes of local musicians playing against the backdrop of Table Mountain. Consciously connecting with her French ancestry, she inspires art aficionados with scenes reflecting communal harmony, joie de vivre and the general tone of the Mediterranean way of life. Similarly she commemorates her Celtic roots through capturing the timeless calm of the English countryside, as in her waving lavender fields. Yet Ronnie's work is quirky. Painting in a fast, multi-layered manner, she brings her subject matter to life by achieving asymmetry within a symmetrical framework. Her crooked Mediterranean cottages, whether bathed in sun or moonlight, dance and twist, as if wanting to fly off the canvas. And yet one derives an indefinable sense of peace and timelessness from these constructions. Her musicians might be making music together, yet a deep serenity flows through their forms. This understated tension between opposites is what makes her work utterly appealing and seductive. It also gives her work an eternal freshness. This is no doubt why her paintings enjoy such worldwide acceptance and a long wall life, whether in corporate or home environments. Her paintings linger in the mind like an unforgettable song. Her human forms flow naturally, reflecting relaxed, dream-like postures. Striated guitar strings, curvaceous keyboards and long wavy hair merge into a mesmerizing snapshot, capturing a memorable moment in time. ​When I asked her what drove her to spend thousands of hours at the canvas, her answer was simple: "My work comes through my heart to your heart. If it resonates it resonates. If not, then not." 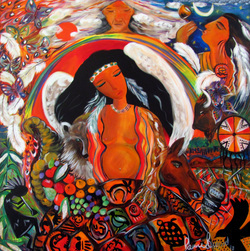 Being well travelled and well connected to her ancestral roots, the universality of her art is no accident. Ronnie is clearly an artist without borders, which is why her paintings have been exhibited in London and New York and bought by collectors in Australia, Europe, the UK, Canada, the US, and Africa. Some of her notable clients include the erstwhile businessman and philanthropist Donny Gordon, the British Embassy in Pretoria, and corporate buyers. Her most amazing commission involved a Nigerian telecommunications tycoon who commissioned her to the tune of nearly a quarter of a million rand to populate his entire Hyde Park mansion with her art. Whether one relates to Ronnie's work or not is irrelevant. Her quirky style has already captured the hearts of many art collectors by bringing colour, warmth, romance and merrymaking into their lives. South Africa,the land of my birth with the diversity of peoples and cultures, the landscapes and the light, the colours, the seasons, the sunshine and the intense energy , has influenced my work greatly. Sometimes I start with just an idea I get from sitting in my favourite chair that I inherited from my mom (internal emotional rumblings and ideas)or, a title of a poem or song , or a quote, or just something someone said. Our home, with the gatherings and celebrations is a constant source of inspiration. I also get inspired just by splashing paint and colours onto a white canvas and from there images arise and fill my head, the splashings of colour mostly transform into figures. These are the artists that have made the deepest impact on me:- Modiliani, Klimt, Lempika, Mucha, Cezanne, Gaugin, Matisse, Renoir,Botticelli, Chagall, Kandinsky, Picasso. 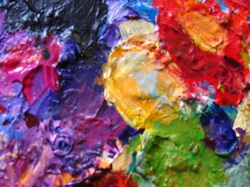 These are the artists I just love: Paul Klee, Jackson Pollock, Mark Rothco, Rubens, Rembrandt ,Hockney, Dali, Warhol. I cannot go on without mentioning my all time favourite architect-----GAUDI !!!!!! I am inspired by human relationships, especially the role of women. I call them the Modern Goddesses. They have anonymous faces and fluid bodies, they transcend reality and express the subtle nuances of life.They reflect the graceful movements of human emotion, they exude warmth, charm and joy. 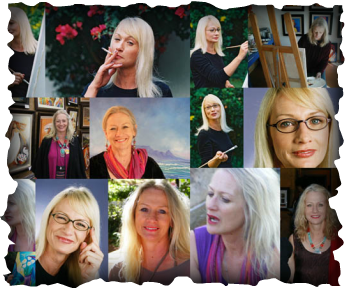 The element of whimsy and fantasy is especially expressed in the way I paint my Goddesses. 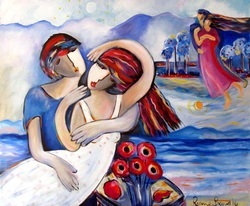 My paintings celebrate the Love that resides within these Modern Goddesses. And I honour them all. my buildings are all crooked and my subject matter seems to dance in and off the canvas . Everyday ordinary objects, the environment, landscapes, animals, birds and fish, people,-all become the subject matter that I use as universal or personal symbolism and images which I transform and interpret into personal visual statements- recognizable as well as abstracted..
My art intertwines reality and illusion, creating works that are fluid as well as defining . I draw inspiration and reference from many varied sources. ​ that speaks to the very Soul of the client. With each painting, which is approximately 80x100cm in size, I do a full reading explaining all the symbolism in the painting. Each painting has a central figure which represents the Goddess from mythology that symbolizes the Inner Modern Goddess that is the client herself . To commission one of these special paintings please email me for prices . This is a unique and very special gift you can give to yourself or some special. I Paint ! I draw! I I illustrate! I play! I make amateur movies! I renovate houses and decorate them! I garden! My colour palette is bold, vibrant and strong. I do however use muted tones in some paintings. I think colour is the most important element in my work and has been for years.I love cololour and see the world in colour . I can taste colour!!! I use the elements of space and shapes very personally, they are mostly flattened and sometimes don’t make any sense.I do not adhere to any theoretical rules about perspective. 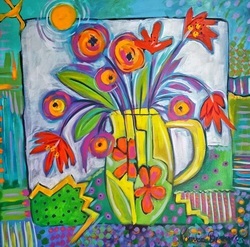 In some of my paintings I use patterns and textures, but by and large my work is quite free flowing, loose and linear. and I can’t begin to imagine into which “ism” it belongs. My paintings express the dance of life . I occasionally fly off course and paint in mixed media. 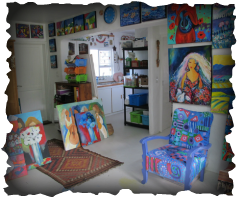 interior decorating, picture framing, blogging and teaching. Somewhere inside of me there is a book!!! !